In Part 1 of “Our Commitment to Historical Accuracy,” we talked about Great Divide Pictures’ philosophical foundation – that the best interpretation is the one that best serves the story and the viewer. We also defined historical accuracy, explored literal interpretation versus accurate impression, and how we work with historians. Here in Part 2, we talk more about the physical craft of making historically accurate films. Many of the films we produce are for the National Park Service, and require a very high level of historical accuracy. 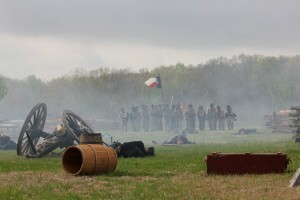 Audiences trust our storytelling, and this responsibility has led us to develop unique strategies and techniques to deliver historically accurate reenactments on any budget. Here’s how we do it. Given our partnership with the National Park Service, we often have the privilege to shoot on actual battlefields, in historic homes and at archaeological sites that would otherwise be off limits to production. This may not be obvious to an audience, but it does add a highly valued element to accuracy. It also serves to motivate the cast and crew who carry a reverence for these historic locations. Given that many of our reenactors have ancestors whom fought and died on the same battlefield we are now shooting, an extra degree of motivation is added to the performance on screen. Many of our films are praised for authenticity simply due to our commitment to building authentic sets with high quality period props. We do this because the extra time and money spent will be seen on screen, maximizing our limited budget, and improving the accuracy of our films. For the Kennesaw Mountain film we invested a great deal of resources into the construction of period correct Confederate earthworks. Working closely with the park’s chief historian and chief ranger, we created building plans based on historic record for a local contractor to construct a 60-foot section of the Dead Angle on Cheatham Hill. It was a rare and beautiful set built at full height with accurate dimensions, and inspired dramatic performances from the actors. On another recent project, we shot a scene for a Civil War hospital inside of an historic church that actually served as a real Civil War hospital. Before the performance by the actors, we showed them the original bloodstains embedded in the wood floors. This set a serious and somber tone to the scene that was captured on camera. Given the lack of historical facts available about the hospital we were portraying, we chose a surreal look for the scene streaming light through windows and atmospheric smoke to give an angelic impression that best supported our story. 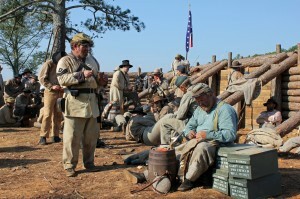 For the Shiloh Civil War film we created several large-scale period camps based on detailed historic records. Some of these camp sets used as many 50 tents, officer desks, wagon teams, countless ammo boxes, benches, and cooking kits. The details of these smaller props brought the sets alive with a lived-in look. The overall effect of these elaborate sets added an epic feel these films. For our reenactments, we work closely with historical tailors and other costume experts to make sure the wardrobe for the main characters is as accurate as possible. Most of these costumes are hand made for the main characters whom are the visual focus of the scene. We often commission 2 or 3 clones, such as a Civil War uniform, as we will destroy a jacket with special effects like mini ball hits and bayonets strikes. However, for background action we favor a more generic costume as our actors often portray multiple characters in various roles. Audiences won’t typically notice the costuming details of background actors as their attention is drawn to the main character in the scene. Indeed, there are often times when our camera angles are framed to minimize a less than perfect historical impression. Hair and makeup are also featured prominently in films, and like costuming, change with the time period. Our hair and makeup artists will study the time period consulting with experts to create the right look. But, our use of makeup extends beyond vintage curls and Native American war paint. We also create special effects like battlefield dirt, blood and wounds. To show the brutality of the Civil War we had our makeup artists apply fake blood, bullets wounds, gore effects, and various skin tones before each scene. This adds a shocking credibility to the look and feel of the film. 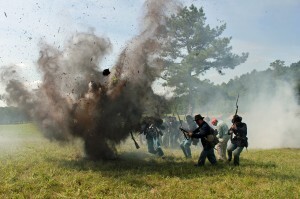 To add visual drama and authenticity to our scenes, we work with special effects experts to create period correct battlefield explosions, squib hits, and atmospheric smoke. Great attention to detail is given to these effects to maintain historical accuracy. For example, there are several kinds of cannon fire used during the Civil War; canister, case shot or standard mortar shells. Each type of mortar has a distinct explosion that varies from ground hits with large debris to mid-air explosions with no more than a pop and shrapnel. Based on historic record, we can define the type of mortar fire and create those specific effects on camera, adding to a scenes authenticity. Do we sometimes take creative license with the special effects used in our films? Sometimes yes. For example, at Civil War battles like Shiloh, Chickamauga, and Kennesaw Mountain, the artillery rounds most often did not hit the ground. Instead exploded over the heads of the soldiers, often hitting the trees. Our budget resources make recreating this complicated effect impossible. So we compromise by setting artillery explosions in the ground. The result is incredibly dramatic shots. Are they perfect? No. But do they graphically convey the horror of war to our viewers? Yes. And that is the primary goal. There is no denying that our films also have to be entertaining. Our job is to light the fuse for visitors to pursue more information, and to inspire a lifelong study of important stories in American history. At times, historical license can be taken without doing damage to the history itself. Our special effects experts also create surreal environments with smoke pots, flame bars and airborne dust. These historically accurate elements may not be obvious to audiences, but they do create the period correct feel that adds to the films authenticity and believability. For example, we blew a special kind of dirt into the air know as Fuller’s Earth to add an atmospheric layer to marching scenes and workers digging in a field. This added emotional depth and intensity to these scenes. Undoubtedly the most valued members of the production team are our reenactor partners. They are truly “living historians,” having spent years if not decades perfecting their impressions and studying the time period. Each reenactor is an expert on their own, and brings an important level of detail to our films. We have found that working with the command structure of military reenacting units adds a great deal of efficiency to our productions and saves valuable resources. After all, on our shoots, time really is money. The more time we can keep the cameras rolling, the more shots we can capture. More shots mean better options in the edit room. Most often, that means a better film. We also have found that treating these reenactors well with great catering, snacks and the constant flow of water breaks bodes well for good will, and for better performances. For us, it is all about respect. We understand our projects would be impossible to accomplish without the passion, cooperation and expertise of our living historians. Our mission is to educate audiences in an entertaining way. To us, character and story are paramount, and we are constantly on the hunt for real life characters to whom our viewers can relate. By working closely with historians and reenactors, using creative camera work, and relying on an arsenal of effective production techniques, we are able to maintain a high level of historical accuracy. This translates to an informative and entertaining film, where audiences will walk away with a basic understanding of historical events, and be inspired to dig deeper into the topic.